Mark St. Mary in the ballroom of the Alameda Hotel in Alameda, CA. Photo by John Noltner. Mark St. Mary’s family came to the Bay Area around 1960 in search of “better money” and greater freedom. “There was no civil rights,” he recalls of those days in Louisiana. “It was just bad. You can’t go to this wash house; you gotta be careful of the Ku Klux Klan.” The family later relocated to the Sacramento Valley but continued traveling back and forth between California and Louisiana. Most of the St. Mary family worked in construction, but they were more famous as performers of Creole music. Today St. Mary lives in Alameda and calls himself the Delta King, a title he received at the Isleton Crawdad Festival. 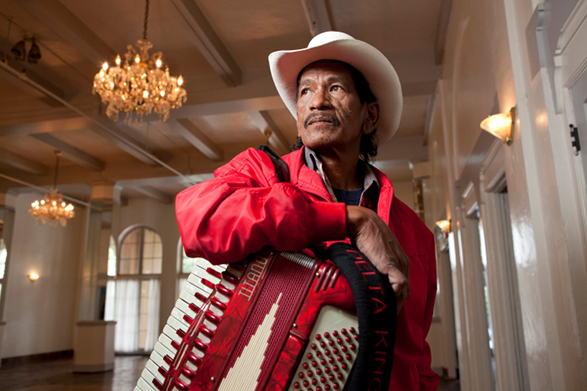 He plays a bluesy zydeco style influenced by accordionist Clifton Chenier. Depending on the venue, he might play pure zydeco, or he might “cut loose,” throwing in “a little R&B, jump, and a little down-and-dirty belly rubbing.” In this clip, he talks about the dances during his childhood in Louisiana—and how his father used tough love in encouraging his musicianship.